Mix together: 2 cup creamy peanut butter, 3 cup rice krispies, 1lb (3cup) powdered sugar, 1/4 cup melted butter. 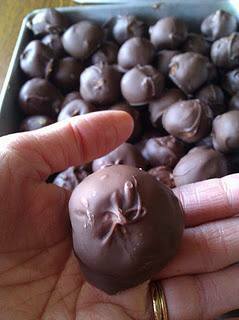 Make balls and dip in melted: 2 (maybe 3) package milk chocolate chips. Put on cookie sheets in fridge to harden.